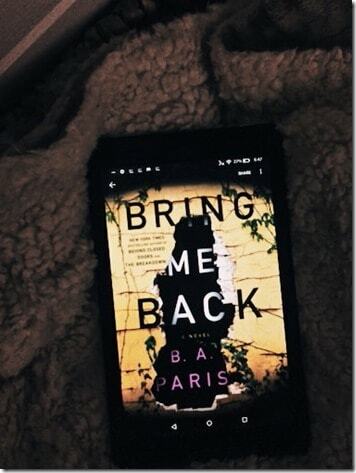 Bring Me Back by B.A. Paris. Finn and Layla are on a romantic holiday and stop at a secluded area so Finn can use the restroom. When he returns, Layla is gone. Literally vanished into thin air. 12 years later, Finn has moved on and in a relationship with Layla’s sister, Ellen. But something strange is going on and both Ellen and Finn are caught in the middle. Someone claiming to be Layla is leaving clues for both of them. Someone wants to re-open the missing person’s case. Someone doesn’t want Finn and Ellen to ride off in the sunset. What follows is an extremely twisted story of obsession, jealousy, revenge, and enough mental instability to keep the writers of Criminal Minds busy for 3 more seasons. And I devoured every bit of it. And loved it. However, I’ll be honest. I didn’t like any of the characters except the dog. Yet, despite my growing disdain for all of them, I could not put this book down. One minute, I’m frantically searching for some detail to be happy about and the next I’m imagining some extraordinary method of demise for the whole cast of characters. I’m still mulling over this book a few weeks later. THAT is very rare. Not one character gained my support but I’m still thinking about them. B.A Paris took me on a ride that I didn’t want to end. Bring Me Back will be available June 19. Thank you to NetGalley and St. Martin’s Press for the copy for my honest opinion.